Many buyers, when they think of USDA loans for “rural” properties, they automatically assume that they need to buy in Burgaw or outside Leland. In reality, they can still purchase in New Hanover County and may even be able to purchase within a Wilmington zip code. As of the publishing date of this blog post, there are communities in Murrayville, Castle Hayne, and Porters Neck that fall into the USDA zone. 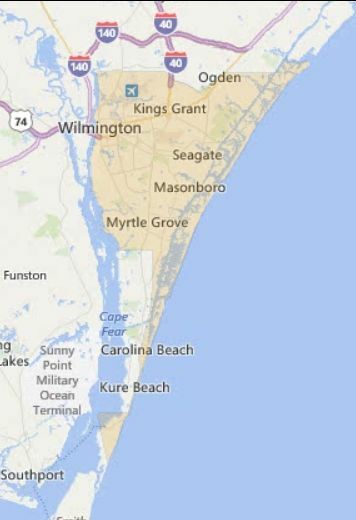 There’s even a USDA zone that stretches through the Carolina Beach and Kure Beach zip codes. So, you don’t need to be far from the cultural and lifestyle benefits of living in Wilmington. So, how do you find out if a home is USDA eligible? There is a handy-dandy map where you can search by address. However, final eligibility will be determined by Rural Development when the loan application is submitted. The USDA warns users of this when they use the map. You’ll also want to make sure to recheck the map after an extended time period, because the maps do change. Unfamiliar with USDA loans? The program’s full name is the USDA Rural Development Guaranteed Housing Loan program, also known as “USDA loans”, “Rural Housing Loans” or “Section 502 loans”. They are 30 and 15-year loans for low-income families that are insured by the USDA. They allow you to finance 100% of the home’s price (no down payment) with pretty good interest rates and mortgage insurance included in the loan, but the loan must be used on a primary residence found in a designated rural zone. You do also need to pay closing costs, but the lender will give you a full breakdown on extra costs. Overall, it’s a great loan program if you can qualify. If you’re ready to buy in the Wilmington area and need a reputable lender to help you secure financing, give us a call or send us a message through our Contact page. We’ll be happy to put you in touch with a loan officer who handles USDA loans, as well as other programs.